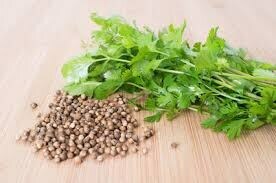 Coriander seed essential- Steam distilled oil from the dried fully ripe fruit(seed) of the corian drum sativum. The odor is a fresh, spicy sweet floral. Benefits of coriander are antibacterial, aphrodisiac, carminative, digestive, fungicidal, stimulant, revitalizing, anti- rheumatic. Essential oils with which coriander oil can be blended with are bergamot, black pepper, cinnamon, grapefruit, ginger, neroli, lemon, lime and orange. Other common usages, perfumery compound, soap and candles.